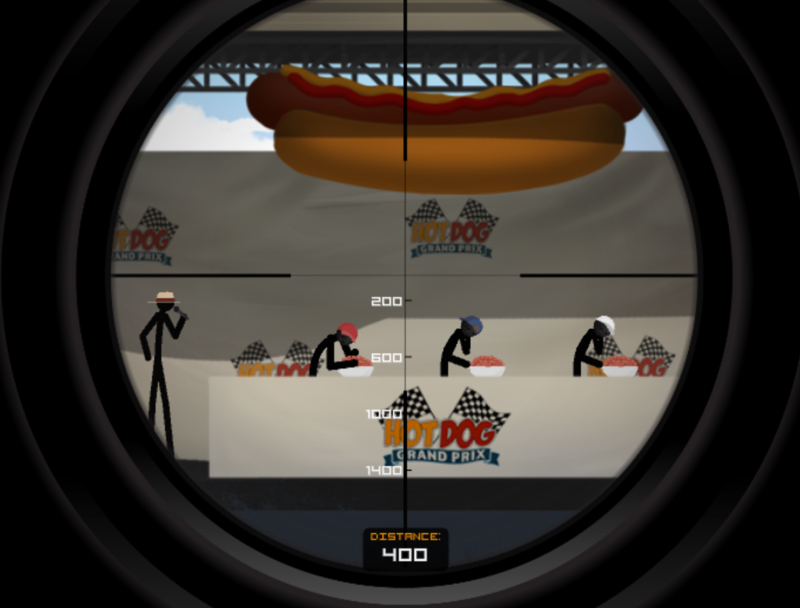 The sniper video game Clear Vision 4 has a mission where the player is tasked with an assassination at a hot dog eating contest. Ganbatte, a video game about cats in a sushi eating contest, will be released for the Steam platform on April 19. (video trailer). update VRFocus has a post about the game. TheVerge.com has a review of 1-2-Switch, a package of minigames that will be included with the new Nintendo Switch platform when it is released on March 3. One of the games is an eating contest game requiring players to open their mouths in front of the camera. The 2008 Major League Eating game or the Wii has made Geek.com's list of "The Most Shameless Food Product Placement in Video Games". One day, Mr. Wang, a silk trader, became possessed by an evil spirit of gluttony. Can he be the king of food fight(competitive eating), and be free from the evil spirit?! Eat and eat, to gain enough weight! Enjoy the great puzzle & action games of real food fighter! The video game streaming website Twitch has started a "Social Eating" category, but will not allow eating contests on it. The Burger & Shakes - Fast Food Maker iPhone / iPad game has a hot dog eating contest mini game. ITunes has an app for a game called Foodie King where you play a Mafia member with a big appetite who tries to eat all the food at a restaurant with an outstanding debt. MrCapKevGamer has uploaded a walkthrough of the section of The Simpsons video game where Homer competes in an eating contest called "Around the World in 80 bites". The competitions's defending champion (appears at end of video) is based on Takeru Kobayashi. A power pellet (cookie) eating contest was held at Level 257 in Schaumburg, IL Saturday in honor of Pac-Man's 35th birthday. Eating contests are one of the activities held during the Yule Festival in Lord of the Rings Online. The foods used include pies, eggs and mushrooms. The next bug fix for Sims 3 will prevent characters from dying of starvation while competing in an eating contest. AppShopper announces the release of the iPhone app "Mr. Couch Potato World Sushi Eating Championship" video game. update Dec 18 The app is now available for free. Large Animal Games released the Nomsters video game for mobile devices today. Takeru Kobayashi will do a fruit eating challenge when one billion in-game fruits have been collected worldwide. zskyrme has a video of a death in a hot dog eating contest in the The Sims 3 Seasons. Competitive eating fatalities appear to occur at a high frequency in the video game. The SimsVIP twitter has a screen capture of a hot dog eating contest from The Sims video game. The Verge reports that there will be a pie eating contest in The Sims 3 Seasons. The contest appears at the 31 second mark of the trailer. Epic Meal Time has produced a game app. TouchArchade has a review. Patch.com Gamespot.com has an article about Bob Shoudt's likeness being used in the recently released Major League Eating app. Joey Chestnut does not appear in a LaughingSquid blog entry about the app, so he might have been removed from the 2008 Wii game the app is based on. GameSpot has pictures of all the eaters appearing in the Wii game. Anonymous: Let’s keep anti-Semitism off eatfeats. Posts © 2005-2019 ojrifkin · Original design by Beccary · Sponsored by Weblogs.us · XHTML · CSS 20 queries. 2.494 seconds.